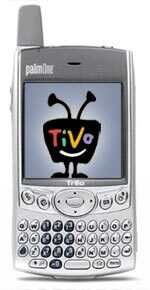 Jason Shellen, of Google, wrote briefly today about his experience programming a Tivo from a Treo 600 cell phone. Jason was using Tivo’s new “Online Scheduling” feature and sounded very impressed with the whole experience. I’ve been scheduling recordings on my Series 1 DirecTivo with my Treo 600 phone for several months now, but I’ve been using the open source TivoWeb software instead. Installing the tiny TivoWeb package on your box turns it into a full-fledged web server with access to the outside world. The end result is that from any browser in the world (including the nice one on the Treo), you can access every aspect of your Tivo’s interface. You can even search for programs or physically change what channel your TV is tuned to… all via IP. And since TivoWeb is HTML and CSS driven, it’s a snap to create stylesheets which look great on desktop browsers and handheld devices as well. So I’m wondering… has anyone tried both the official Tivo Online Scheduling feature and the TivoWeb Project’s open-source implementation? Are there any compelling reasons to use one over the other? I’m sure the lack of command-line setup and other Unix scariness is a big plus on the side of Tivo’s official service, but is it as powerful as what the TivoWeb Project gives you? In other words, can I freak housesitters out by changing channels from halfway across the world? I think if more people were aware of features like remote scheduling, we wouldn’t see the levels of DVR/VCR ambivalence we still see in the market today. Why is Doogie Howser telling me how to pause football games when a less annoying celebrity could be telling me about remote scheduling? One comment on “Treoing your Tivo”. Leave your own? I don’t have a TiVo, but I do have a ReplayTV. I am involved with a third party project called DVArchive that is basically a server that allows you to store your recorded programs on your computer. We have added a web server to the program, allowing you to control pretty much every aspect of recording and channel viewing. Of course, the web interface is designed using web standards, so it is very easy for our users to change the way the interface looks and even make it minimal for browsers that don’t need all of the bells and whistles.